While reading the first two books, I couldn't help but want Maas to do more. I wanted more character analysis, more epic developments, more more more. Thankfully, she did provide more in Heir of Fire. Caelena/Aelin use to annoy me so much with her sense of entitlement and ridiculous attitude. Now, I'm learning to love her, thanks to Maas excellent character portrayal and story development. Maas also ups the level of magic and other-worldliness, which I appreciated. I need some truly epic battles and abilities in my fantasy novels. The addition of new characters from various places also earned my approval. This third book switches points of view much more often than the past two, and I'm not sure how I feel about that. Like I said, new characters are added, and almost every chapter is from a different person's point of view than the one before. On one hand, it adds more complexity to the plot, but on the other, it forces the reader to constantly switch from person to person. Maas even adds a brand new character, Manon, whose storyline barely even affects the other characters' lives. Even after finishing the book, I couldn't decide if I enjoyed the constant switching or if I found it distracting. So, why not give Heir of Fire five stars if I thought it was such an improvement? Honestly, I don't know what it is, but I just can't make myself fall in love with this series quite as much as I did with the ACOTAR series. Maybe it's the characters, maybe it's the story, or maybe it's just the writing style. Yet again, I hold out hope for the next book. Maybe it'll finally receive the five-star award I so badly want to bestow upon this series. 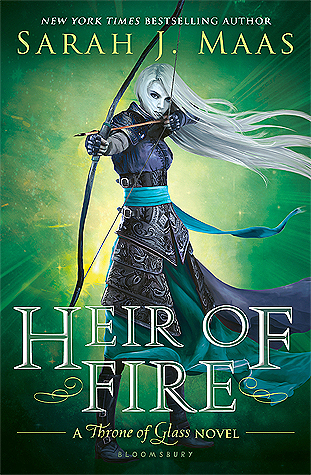 In all, I thoroughly enjoyed Heir of Fire, simply because Maas is an incredibly talented writer and character creator. I didn't fall head-over-heels like I wanted to, but that does't mean I don't really appreciate this series. Things are growing in intensity, and I'm so excited to give the next book a chance.